Welcome Rhelyk and thanks for sharing. It's great to read how the hobby virus can grab hold of you. 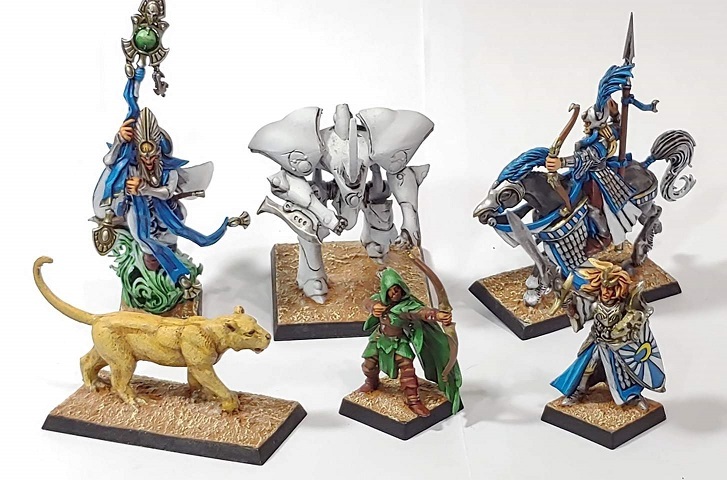 It is a great looking warband and start of an army you have there. The blue and silver is a very nice color scheme. I really like the eternal guard as spearmen. Never thought of doing that. I might just steal the idea if I ever need more spearmen The arcane construct as ent is a great and very fluffy addition. We can't be having all that nature stuff just walking around in an army after all. I hadn't heard about Vanguard before. I'm definitely going to check it out. I enjoy Morheim, even though the rules sometimes feel a bit unbalanced or dated. And the options for models is a bit limited. So a newer game might be fun to look into. Commiserations on the loss. But this is what being High Elf is all about. Fighting for the greater (elf) good and looking pretty while doing it. The terrain you have looks great as well. Nice start of a lovely village. Are the houses scratch build? Of course, feel free to share any other hobby photo's and projects here as well. I love seeing different miniature projects unfold and have a personal soft spot for terrain projects. One thing about the dragon mage. You have enough bits in the kit to build both a mage and a prince. So if you don't glue the mage on to the dragon then you can swap between a dragon mage and a prince on dragon. The rider sits on tight enough to stay in place for the battle without issue. Really nice looking warband you have there! I've been thinking about starting Vanguard to go along with KoW, but for now I am fully in the grips of mass unit battles. 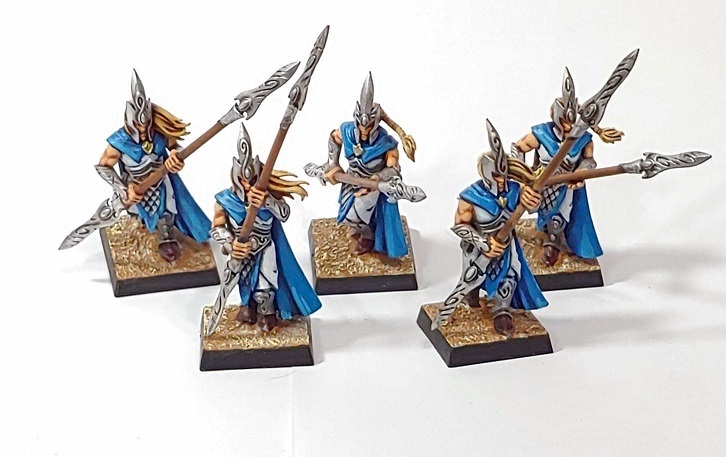 The EG look really nice, definitely better than the stock standard GW high elf spears, looking forwards to this expanding to a full army! Also, I agree that the construct is a nice idea. 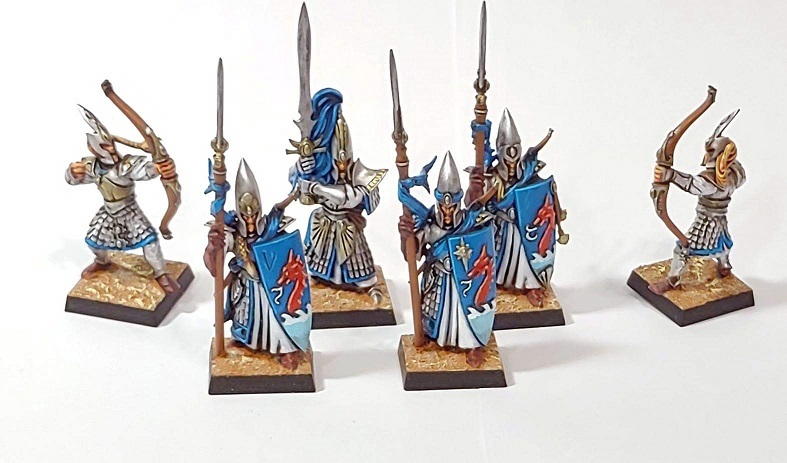 I'm trying to get some old Cynwall Nova Constructs to count as shamblers, it makes absolute sense that Elves would have magical constructs fighting for them! Really crisp looking paint job, especially the white robes. The eternal guard look great with the right paint scheme, seem to fit in no problem. I was looking to do something similar somewhere down the line if I ever felt the urge to buy some new models, but it remains to be seen. My only slight criticism is the construct. 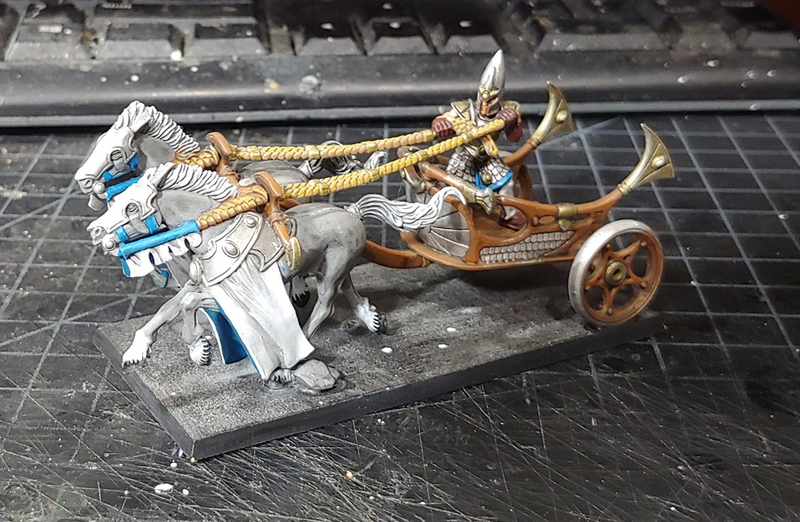 I love the idea behind it, makes total sense to have a waystone magical being kicking bum for the asur, but I think the paint job is missing something. 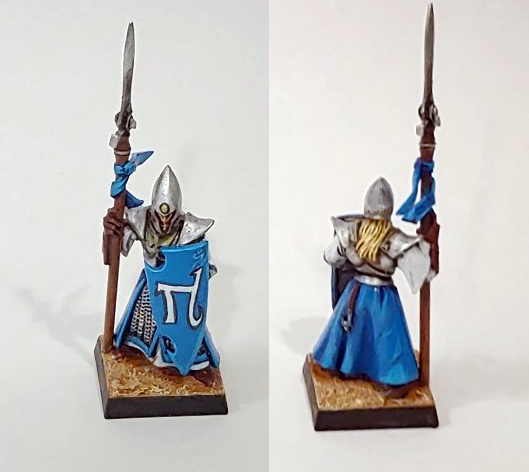 It needs just a little more contrast or maybe some converting to the original model perhaps to make it fit the others in the warband, currently to my eyes it just looks rather jarring. Mind that could just be it being from a different model range. Anyway, that's just my personal preference and the warband looks great, can't wait to see more! I dare say blue-white Asrai look rather splendid. I get that HE classic spearmen kit looks ugly with all the square hands and clumsy postures, yet I find going out without sleeves just too uncivilized. Jokes aside, I'm looking forward to read more for your exploits and see how that new army of yours will develop. Olthannon - you are absolutely correct about the warjack/construct being too bland, but the Retribution warjack designs really resist any easy painting techniques. They have such large, round, featureless areas that it would take me much more effort to paint in detail than I'm willing to do to that figure. If he sees a lot of play I may go back and add...something... to it just to make it pop a bit, but it's going to stay with a mediocre paintjob until it proves itself otherwise worth it. He looks great. You can't tell he started life as a DE spearman. I can imagine that the prospect of doing the modifications for a whole unit of 20-30 is a bit daunting. Start with 4 and take it from there I'd say. The mark of a good conversion. 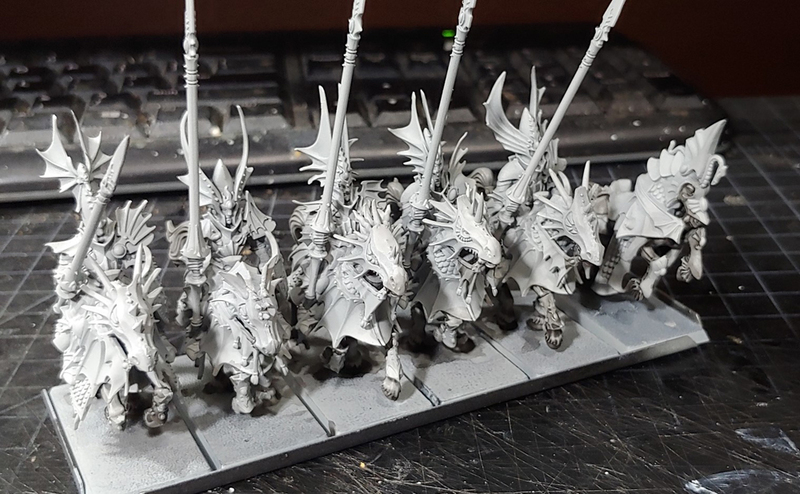 Using the body from DE spearmen and spear and head from lothern seaguard... i think you could create awesome models. Amazing job on the spearmen. Even if he's just a core trooper, combine the lot of tchem and boom! you have an original looking unit much to envy of your oponent. I find the free-hand on the shield to be very solid looking. How many layers of white did you use to get a solid color? I second that. It's a simple step, yet the effects add a lot of depth to models while they don't take a lot of time to do properly. Totally get that, well whatever you do with it I'm sure it'll look great. If you don't mind me asking, what model is that which is the bareheaded swordsman with the Tiranoc shield? Edit: Also forgot to say, I love that DE spearman with the new colours, looks great. Such a nice model and it'll look great ranked up. Unless I'm very much mistaken, it's the GW plastic prince and noble kit. Lots of nice pieces in there. The basic design of characters presented on the box can be quite misleading. It does give you some nice bits to utilize in your army. 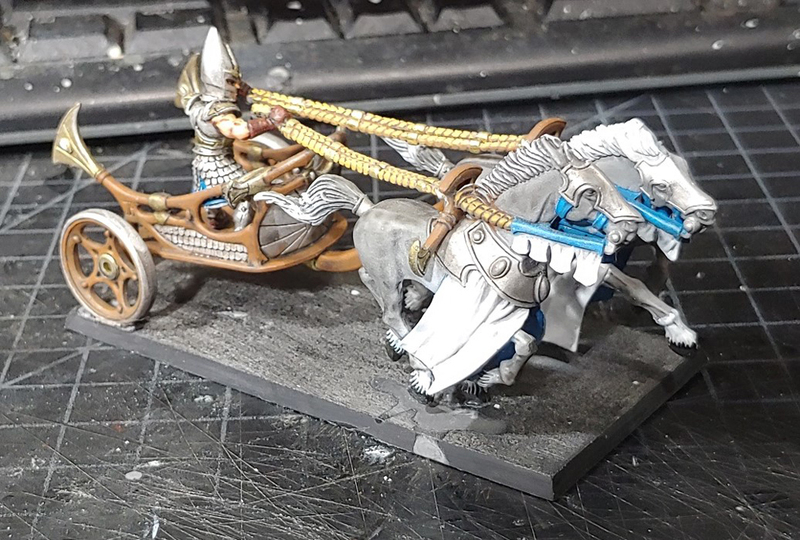 You can even cast some of the pieces to add some character to a whole unit. For example, I'm aiming to make casts of a fish-fin pauldron in order to emphasize the sea-theme of the army. 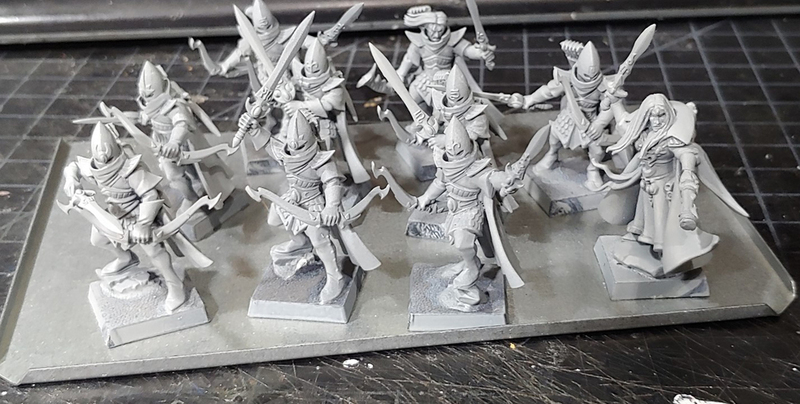 4 More "dark" elf spearmen converted up, ready for primer once the weather cooperates. The freehanded rune on the first one looks OK, but I really don't want to do it for a whole unit or 2, so I've got some various nail-art decals on order, flowers and butterflies and birds and dragons, I'll need to compare them once they actually arrive and see what looks right. I think perhaps because on the store its down as "dragon noble" so didn't want to buy it for just that model but if there's loads of customisation I definitely will try and find it on the cheap. I've been trying to hunt it down but can only really see it on the GW website for 18 quid (23-24 dollars?) which is a tad excessive but I'll keep looking on wayland games etc to see who else might have it in stock. Sorry to derail your thread! Considering the fact that you get two complete characters out of the set plus a whole bunch of extra bits and pieces it's actually one of the cheaper GW hero kits. Though it does pay to watch ebay for a good deal. The kit itself contains body parts two make two hero figures. The customization options allow you to make pretty much all weapon options available to lords and heros (in bows, swords, lances, axes and so on) in the book. This means that if you can dig up some legs and torso bits then the other parts will let you make a lot of other hero models as well. And, if you play around with some insta mold and green stuff then you can easily cast those yourself. Been a couple weeks but I've not been completely idle. 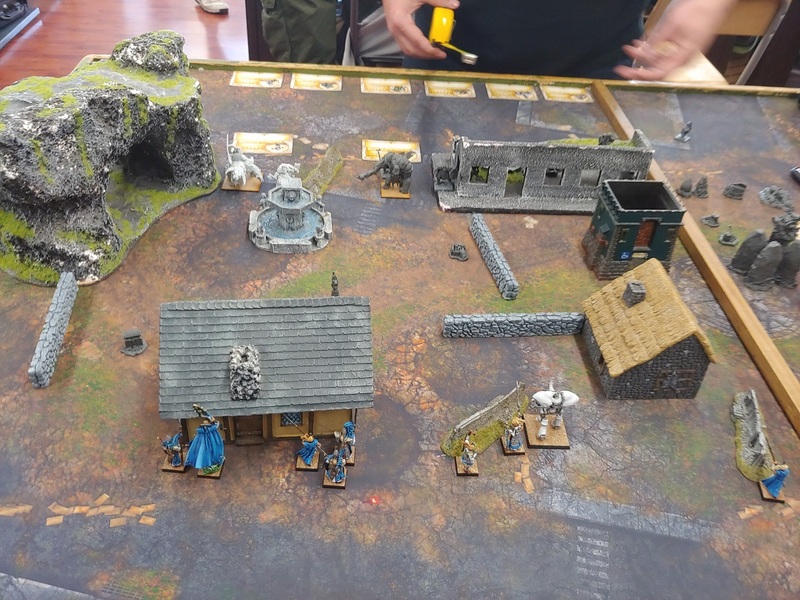 Infinity Imperial Army models got painted and I got 2nd place in the ITS tournament with them, pretty happy w/ that performance.Was supposed to go back to painting elves, but had some things pop up that made that difficult. 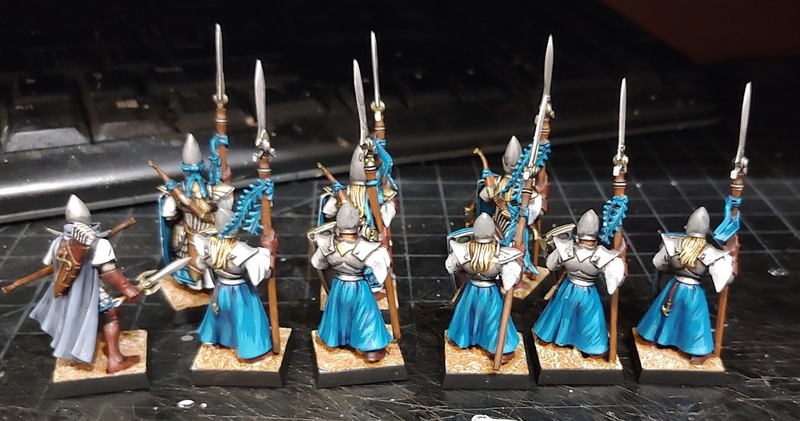 Made a total of 5 High Elf Spearmen from the dreadspears (pictures below), the other 4 I also cut down the helmets to look more like a High Elf face opening, left side of the openings (as you look, model's right side) came out great but the right side (model's left0 are slightly dodgy. 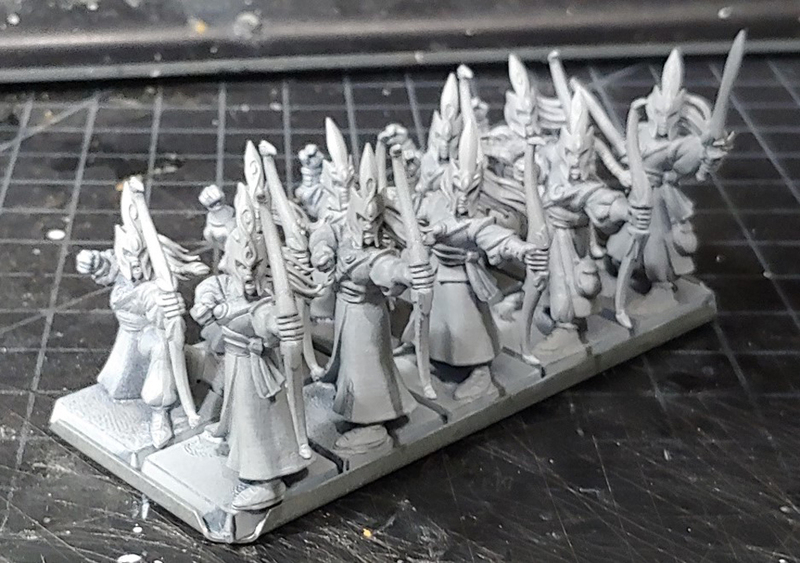 They still solve my biggest problem with the original Delf->Helf spearmen: the faceplate. Yeah but thats a problem with GWs design itself, where they kept giving spearmen heavy armour in the models as the 4-5th edition rules but moved to a lightly armoured army later on. Nice combination of DE spears and seaguard pieces indeed. Not sure if its been mentioned but that pattern on the shields is great. Are those the original DE spearmen shields? Umm one second.. Those are decals? They look nice anyway. EDIT: ah i see helmets are from shadow warriors, arent they? i confused the seaguard on the back with more spearmen. The seaguard in the back are the same seaguard, I just repainted the shields white (they were blue before) to really differentiate them even more from the Spearmen. I think the issue (for me) with the shields and decals is indeed the lack of contrast. Both between the shield and the decal. But perhaps also between the shield and the rest of the model. Somehow, the combination of light blue trim, light blue shield and decal blends together a bit too much. I really like those dreadspear conversions. I think the models would look great in an army from Nagarythe or one of the coastal realms because of their more marine feel in the armour design. And the other 9 Shadow Warriors and another mage assembled and primed. Another upload and what a satisfying one! The Swordmasters look astonishing as a unit but also each and every one of them is well done. Will you be replacing that cut-off blades on top of the banners? They look fine as they are atm, don't get me wrong. utterly mind numbing to do the same figure over and over and over again.